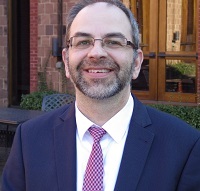 In this month’s staff profile, we meet: John Papadopoulos. For previous staff profiles see below. For readers outside library land, what does your job title actually mean? As College Librarian, I am responsible for all aspects of administration of the library (planning, budgeting, collection development, working with donors and the Friends of the Library, and supervising our staff of librarians and library technicians). One of the most gratifying parts of the job is brainstorming with my amazing colleagues on how to improve and develop new services that we can offer to the library’s users. How did you get into working in libraries? I started working as a page at the Cedarbrae branch of the Scarborough Public Library when I was 15. At some point during law school in the early 1990s I was chatting with Esther Wan, the Reference Librarian at the Bora Laskin Law Library, about her job. It just clicked that what she did – helping people with research, teaching, building collections – sounded like a dream job. After that, I knew I would enter library school as soon as I was done law school. 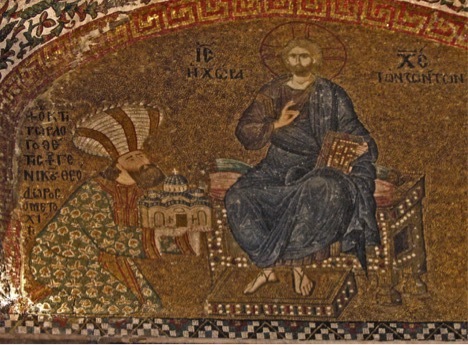 What is your favourite resource at U of T Libraries: I am really fond of the – Prosopography of the Byzantine World. It is now a free online resource (https://pbw2016.kdl.kcl.ac.uk/) but it started off as on old-school CD ROM that the UofT Library had networked for use. It is an amazing tool that allows you plug in the name of a historical person and find references to that name in primary sources. What’s the most interesting or fulfilling thing you’re working on right now? Over the last year or so, Courtney Lundrigan, Adrienne Findley-Jones and I have been working out how to launch and expand our document delivery service for faculty and instructors. Only a handful of libraries on campus offer this, and it has been very gratifying to be able to be the smallest library on campus to offer this kind of premium service. Before working at Graham Library, what was your most unusual or interesting job? After about one year working at the Bora Laskin Law Library my friend and colleague Ted Tjaden felt I was ready (I wasn’t!) to take over teaching his class at the Faculty of Information. Getting up to speed on teaching, developing materials and assignments, and working out the right pace and rhythm for a 13 week term was a terrifying and completely exhilarating experience. Teaching Legal Literature and Librarianship from 2005-2012 was among the most professionally rewarding work I have done. The experience also taught me the importance of creating opportunities for colleagues to take on new challenges. What was the last book you finished reading? Grant and I: Inside and Outside The Go-Betweens. I really like music biographies. This one is a lovely story of the friendship and rivalry at the heart of Australia’s criminally underrated Go-Betweens. What’s your favourite leisure reading genre? I find it difficult to immerse myself in novels at this point in my life. History is easier as I can dip in and out as I have time – I like reading about the history of Byzantium especially the 1261-1453 period. Lately I’ve been really interested in Theodoros Metochites – the guy with the big hat. What was the best concert you’ve ever attended? Lloyd Cole at the Concert Hall 1990. He had Robert Quine and Matthew Sweet in his band. For the first (and probably last) time, sensitive and bookish Lloyd Cole rocked out – an amazing once in a lifetime experience. I’d love to visit Venice again – but in the off-season. It is a magical place, despite the crowds – I can’t image how special it would be when it is quiet. What was the best meal you ever had and where? Arancini – fried rice balls – at La Bucca do Bacco in Positano on my honeymoon in 2000. I love to watch soccer. It is truly an international sport and one can even be short and stocky and still be a star – see Diego Maradona. I used to be a Serie A (Italy) snob, but I’ve slowly come to accept the fact the English Premier League is the most interesting and entertaining league in the world. What’s your favourite thing to do in Toronto? Family walks. Just pick a neighbourhood and stroll aimlessly. Where did you grow up? I’m a Toronto kid. I grew up next to Monarch Park in the east end – street hockey, skating, massive neighbourhood hide and seek games, watching trains go by, just idyllic! Translation: A slightly more frazzled RA for the faculties of 2 colleges. How did you get into working in libraries? Accidental convenience?! I started as a student assistant at the Silcox Library while I was a MDiv student at Huron University College in London. I needed a job and since I was already attending Huron, working at the library made sense: I assisted mainly with circulation. My next library job was at the McMillan Library at the Vancouver School of Theology at UBC where I was working on another Masters degree: I was in the back office assisting with book processing and cataloguing. What’s the most interesting or fulfilling thing I’m working on now? I’d say, but the Library Gods might look unfavourably upon my saying something. Best to say nothing, other than WATCH THIS SPACE. Before working at Graham Library, what was my most unusual or interesting job? I’ve worked as a hospital chaplain before becoming a retail mall rat for a number of years that I will never get back. What aspect of my role at the Graham do I enjoy the most? I get to work at the Graham. Seriously. A little more serious – I get to work with some pretty awesome people to make research magic happen. Where did I grow up? Norfolk County, about 10-15 minutes from Lake Erie. My hometown is famous for having Canada’s longest running county fair, and Christmas lights in our parks. What was the best meal I’ve ever had and where? I don’t know what it is about it, but my mother makes the best ham and scallop potato dinner every Easter. Even duck a l’orange from Le Continental in Quebec City pales in comparison, and that’s some serious duck. What is my favourite sport and why (to play or to watch)? The only sport I have ever been able to both play and enjoy watching is volleyball. If I could do high school over again, I’d be on the school team. For readers outside of the library & archives world, what does your job title actually mean? I am responsible for the library’s outreach programing to increase student engagement and integrate the library into the Trinity College community. I also work in the archives, where I’m committed to facilitating the use of archival material in assignments and in the classroom, and working with student groups who are interested in learning more about the College’s history. I am responsible for liaising with the Friends of the Library and I assist with their programming and publicity. I also participate in the Personal Librarian Program. How did you get into working in libraries/archives? I first began volunteering in my local library to prepare the crafts and activities for the children’s programming while in high school in order to complete my required 40 hours of community service which I needed to graduate. This led to a part-time position as a library assistant. I began working in the Graham Library as a library assistant in my second year as a student at Trinity College, as well as the archives, where I was a summer student for two years. My experience as a student inspired me to apply to the University of Toronto’s Faculty of Information to become a professional librarian and archivist. What is your favourite resource at U of T Libraries? The new UTL Discover Archives portal. It provides researchers with a single location for all of the university’s archives’ finding aids and resources, and has the ability to host digital content. Check out Trinity’s recently uploaded architectural drawings! The Trinity College Historical Society is working with the archives to research and update the College’s Wikipedia page. There is currently a lot of information that is either out of date or incorrect, and this project gives students who are interested in the College’s history the opportunity to do some research and create an incredibly useful product. What would you like people to know about Graham Library or Trinity Archives that they might not know? You can’t eat here! Before working at Graham Library, what was your most unusual or interesting job? I worked for one summer doing a midnight shift on an assembly line processing 5 litre bags of dialysis solution. What aspect of your role at Graham do you enjoy the most? I love when researchers come with questions about the history of Trinity College. It’s always a fun scavenger hunt to find the answer in the archives, and I am always guaranteed to learn something I didn’t know before. What is your best advice for U of T Library users? When in doubt, ask a librarian! If you could visit anywhere in the world, where would you go? I would take a river boat cruise through Europe. For readers outside of the library world, what does your job title actually mean? I supervise the student employees who work at the circulation desk. Our students are so great that I mostly just take credit for their good work! How did you get into working in libraries? I got a job as a student assistant at the Graham Library back when I was an undergrad. I loved it so much that I’ve been here ever since! What’s the most interesting or fulfilling thing you’re working on right now? I’m working on a project to see how our patrons are using the space: what times of day are most popular, what furniture types get used the most , etc. I’m really in the weeds with the detail right now, but I’m excited to see what we find out. What would you like people to know about Graham Library or Trinity Archives that they might not know? The Graham actually has a really cool collection of LP records in storage. Mostly spoken word: the original Broadway cast recording of Who’s Afraid of Virginia Woolf, TS Eliot reading his own poems, Beowulf read in old English. Before working at Graham Library, what was your most unusual or interesting job? I worked in a call centre approving credit on a department store card. It was unusual because I was only seventeen: old enough to grant credit but not to have it myself! What’s your favourite journal/periodical at Graham? New Scientist! It’s a fun read, designed for non-scientists. What is your best advice for U of T Library users? Get out and explore other libraries! We have 44 at U of T. I happen to like the Graham the best, but there are all sorts of different libraries out there: here’s a quiz that might introduce you to one that would suit you! What’s your favourite leisure reading genre? I studied literature so I do love a literary novel, but I’m mostly reading comic books these days! I like a lot of titles published by Image Comics. What was the best concert you’ve ever attended? I saw Radiohead at Molson Park in Barrie back in 2001. The Beta Band opened. It was pretty rad. If you could visit anywhere in the world, where would you go? I’d love to take to the Trans-Siberian Railroad from Moscow to Vladivostock!